Update: ESPN says the game averaged 7.6 million viewers, a Wild Card game record and the most-watched MLB game on ESPN since 2003. The game peaked with viewership of 8.6 million from 10:30-11:00p ET. The Houston Astros vs New York Yankees American League Wild Card drew a 5.7 overnight household rating, a record for a Wild Card game. Astros fans are loving it, but Fox won’t get a single Yankees game in the LDS/LCS rounds. Meanwhile TBS still has the biggest 3 TV markets (New York, Los Angeles and Chicago) in play on the National League side. 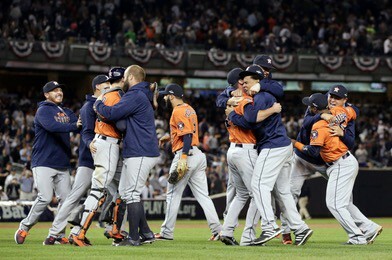 ESPN’s American League Wild Card telecast presented by Hankook Tires– the Houston Astros defeated the New York Yankees 3-0 – delivered a 5.7 overnight rating, making it the highest-rated MLB Wild Card Game ever and the highest-rated MLB game on ESPN in 12 years. Additionally, it generated the largest audience for an MLB game ever on WatchESPN, setting records across metrics, including 445,000 unique viewers, an average minute audience of 127,000 viewers, and 25.7 million total minutes viewed across devices. Generated a 14.8 rating in the Houston, making it the highest-rated MLB game ever on ESPN in the market. It drew a 12.0 rating in New York, making it the highest-rated MLB game on ESPN in the market since 2012. Last night’s 25.7 million minutes viewed for the AL Wild Card Game was up 159 percent from the NL Wild Card Game on WatchESPN last year. Jessica Mendoza made history during ESPN’s AL Wild Card telecast by becoming the first female analyst for a nationally televised MLB playoff game. After the game, her scorecard was collected for inclusion to the National Baseball Hall of Fame and Museum. She called the game alongside Dan Shulman, John Kruk and Buster Olney with Tampa Bay Rays star Chris Archer contributing. ESPN Radio is documenting every pitch of the 2015 MLB Postseason, which continues with the National League Wild Card Game – Chicago Cubs at Pittsburgh Pirates – Wednesday, Oct. 7, at 8 p.m. ET. Jon Sciambi and analyst Chris Singleton will describe the action.